For use with the Saga edition. During the clone wars the separatists forces were ever searching to perfect their secret ultimate weapon. 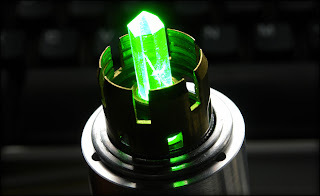 it was on the jungle planet of Ordatis that large green crystal deposits were discovered. during testing it was shown to have great focusing abilities. The Kel-dor Jedi knight Kor Loon has used a shard of the Ordatis crystal within his lightsaber providing it with a pale green blade, as well as offering greater abilities for defence.